View any property, represented by any company, instantly just by connecting to us. number of updates and features that we’ve added to our website over the last couple of months has almost been overwhelming. A totally new property search system and total access to all of the information that’s possible through MLS is now at your fingertips right through MoveToBend.com. 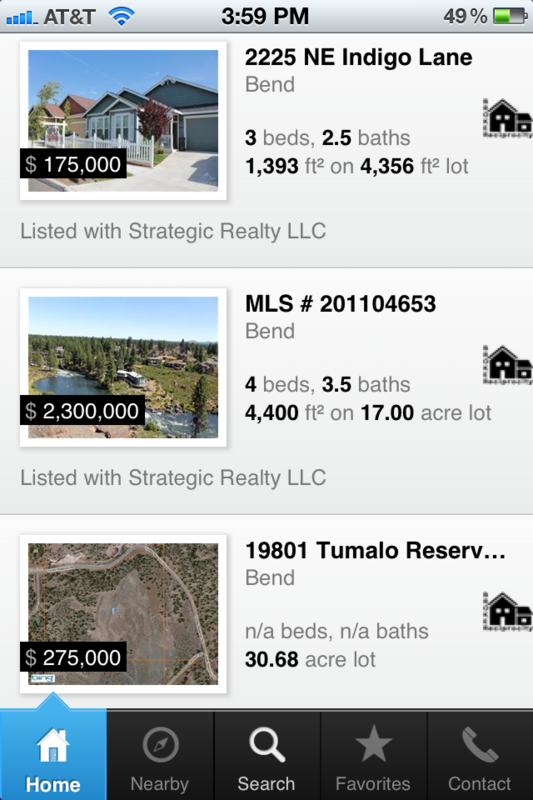 When working with our customers and talking to many people that rely on our site to find Bend area homes for sale, we were amazed to find that almost 10% of our traffic is from mobile devices such as iPhones and iPads. That’s why we are very pleased to announce that we have also included the most advanced mobile real estate searching platform we could find. And as they say…but wait…there’s more…. Now, when you log on to MoveToBend.com from your smart phone or mobile device, you will be prompted to go directly to our mobile-optimized MLS access. This system is so intelligent, it will use the GPS chip in your device to quickly show you homes for sale that are closest to your precise location. When you are anywhere in Central Oregon and you see a property you like, simply pull out your smart phone or iPad and visit our website. After you arrive at our mobile access site, you will quickly be able to search properties NEARBY at the bottom of the screen. Once you find the property you’re looking for, just touch it for more information including multiple photos, days on market, and tons of additional information. Mark the properties your interested in as “favorites” and you can quickly come back to them. Use Facebook, Google, or your Yahoo account to login and you will be rewarded with even more information, plus you’ll have the ability to Share properties you found with your friends on Facebook, Twitter, and via email. We work very hard to make sure our clients have the most advanced tools in the industry and we couldn’t be more proud of these latest additions.